We haven’t focused on a website in a while, so while we wait for the next scheduled update, why not dig in our portfolio for more examples of great creativity and customization skills displayed by Oxwall members. 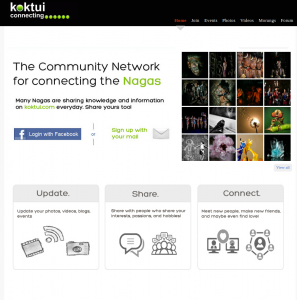 Meet Koktui, a niche community network for connecting Nagas of the world. And if you don’t know who the Nagas are, maybe you should join the site and get introduced to their amazing culture. The site itself shows great implementation of web 2.0 aesthetics. The presentation is crystal clear and easy on the eyes. The front-page design is intuitive, straightforward and very inviting. Everything about the destination gives the immediate sense of calm, professionalism and dedication to bringing members of a specific community together. And that’s all we need to award this social network the In Focus achievement. Great job! One of the benefits of developing open source software is that sometimes you have to resort to trial-and-error philosophy, which makes you constantly learn something new. For instance, last thing we learned here at the Foundation was that we should NEVER give promises to release updates ‘next week’. The aforementioned philosophy, though, can be used to great effects while tweaking and customizing Oxwall software. Meet Presence Effect – a growing network from Russia. So, at first glance this is a site about aliens or video gaming. Either way it’s awesome. Seriously, what we have on display here is a great deal of design customization brought to the original Oxwall template. It truly shows the flexibility of the solution. The network’s presentation is appealing and right on target for the preferred community. Good job all around. If a website in those things Russians call letters made me stay for longer than at Gamestop, I’d say the mission was accomplished. If anything, Presence Effect shows that with a creative approach an Oxwall-powered site can be turned into a real professional community hub. Oxwall’s In Focus achievement well earned, comrades. Congratulations!